The Bring Your Toyota Home & Win Contest (bringyourtoyotahome.ca) is open to residents of Canada who have reached the legal age of majority in their province/territory of residence. The Bring Your Toyota Home & Win Contest ends on August 31 at 11:59:59 p.m. ET. Go to bringyourtoyotahome.ca and follow the on-screen instructions to enter your Code in the space provided. Next, follow the on-screen instructions to obtain, complete and submit the entry form to be eligible to earn one (1) entry. There is a limit of one (1) Code Submission per person, per Week. 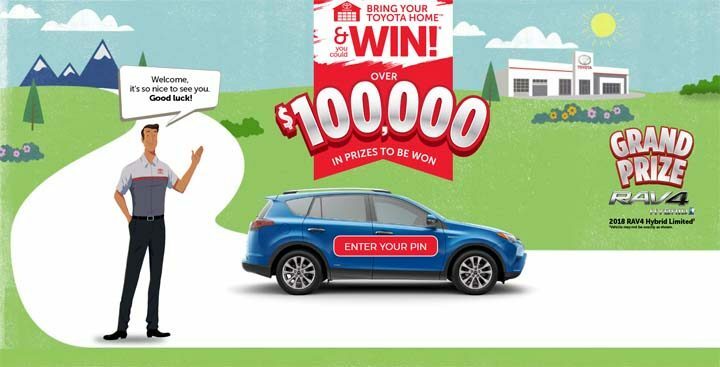 Grand Prize: There will one (1) Grand Prize available to be won consisting of a 2018 RAV4 Hybrid Limited with an anticipated approximate manufacturer’s suggested retail value (the “Anticipated MSRP”) of $41,000 CAD. Would love to win the car or any other fabulous prices. I really enjoy Toyota vechicles.I have 2. Toyota makes the finest vehices. Great car and good service! like to win the RAV4! So very good at servicing my Toyota that I’d be reluctant to buy any other kind of car!